US embassy in the capital Addis Ababa said it had received “troubling reports of ethnic violence and the large-scale displacement of people”. 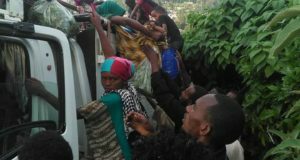 The United States on Tuesday urged Ethiopia to investigate deadly clashes between two of the country’s major ethnic groups that have caused tens of thousands to flee. “We believe Ethiopia’s future as a strong, prosperous, and democratic nation depends on open and inclusive political dialogue for all Ethiopians, greater government transparency, and strengthening the institutions of democracy and justice. These recent events underscore the need to make more rapid and concrete progress on reform in these areas.” the release concluded. We urge the Ethiopian government to conduct a transparent investigation into all allegations of violence and to hold those responsible accountable. At the same time, on the local level, communities must be encouraged and given space to seek peaceful resolutions to the underlying conflicts,” the statement read in part.